So, What Are You Saying, Can I Use My Hybrid? I’m prepared to bet the princely sum of twenty guineas that someone (indeed, many people) on a hybrid bike beat my time at RideLondon 2013, despite the fact I was riding a ‘sportive-specific’ road bike. Political Clydesdale Boris Johnson successfully completed the course on a Boardman hybrid. An esteemed reader of this blog, Kristian, has even done the Étape Du Tour on a hybrid bike and claims to train by doing laps around Richmond Park with a big bag on his rear rack (note: not a euphemism). The thing is, in using a hybrid, whilst you’re potentially saving money, you are doing so at the expense of making your sportive ride more challenging. And if you’re anything like me, doing a sportive on a well-fitting road bike is challenging enough, thank you very much. So, you ask, what is it that makes a road bike more appropriate than a hybrid to the sportive cycling task? Hybrid: (Noun) 1. The offspring of two plants or animals of different species or varieties, such as a mule; 2. A thing made by combining two different elements. So, a hybrid bike is the result of a mummy road bike having a little ‘how’s your father’ with a daddy mountain bike. The resulting offspring inherits the flat handlebars and gear shifters from the mountain bike (plus a little of the sturdy construction). From the road side, the hybrid bike will tend to sport a pair of smoother, tarmac-suited tires and the odd svelte line here or there. Not all hybrids are created equal: some will be closer to the mountain bike end of the scale; some will be a bit more like road bikes. For instance, my hybrid bike (purchased more as an accessory to a newly-acquired child’s bike seat, than for its own merits) sports a pair of low quality (rarely needed, heavy) set of front suspension forks. As we’ve said, there is no such thing as definitive hybrid bike. Hybrids exist all along the road-mountain continuum (technical term, no need to look it up). Also, some of the following ‘differences’ are more a result of hybrids tending to occupy a lower price point than many road bikes. For instance, if a £3,000 hybrid bike is available (I assume there is, somewhere), then we can assume it would be pretty close to the weight of an equivalently-priced road bike. Whatever. Let’s get on with the crass generalisations. For an equivalently-priced model, the hybrid will weigh quite a lot more (certainly at the lower end of the market). They tend to use heavy chunky frames and heavy chunky wheels. Budget that might be used on lighter versions of these elements, is used up on non-useful components (to the pure roadie) such as a suspension forks. The seating position on a hybrid is more upright than even a sportive-type road bike (which will have a more relaxed upright position than, say, a time-trial bike). Over the course of 100 miles, being in a more purposeful position, reducing wind drag can lead to a much easier ride (and faster time). If there are more components on a hybrid bike versus an equivalently-priced road bike (e.g. the aforementioned suspension forks) then it follows that what components are there will have to be of a lower quality (and price) in order for the bike-maker’s sums to add up. The gears on a road bike, particularly one aimed at sportive riders, will have the right ratios to make ascending Leith Hill and Box Hill as painless as possible, whilst still have sufficient gear ratios available in the big ring to reach warp speed on flat and down hill sections. With hybrids, the ratios may be suited to flat city riding (with the caveat that gearing will vary from hybrid to hybrid). Saddles that come as standard on a hybrid tend to be more comfortable than those on a road bike… for about 10 miles. Above that distance, the road bike saddles are more comfortable. I’ve done a day long ride on my hybrid, with cycling shorts, and been very uncomfortable… (VERY uncomfortable). There’s no getting away from it. The sorts of sportives we’re interested in take place on roads. Long rides on roads are best undertaken on a road bike (and ideally one suited to sportive riders). 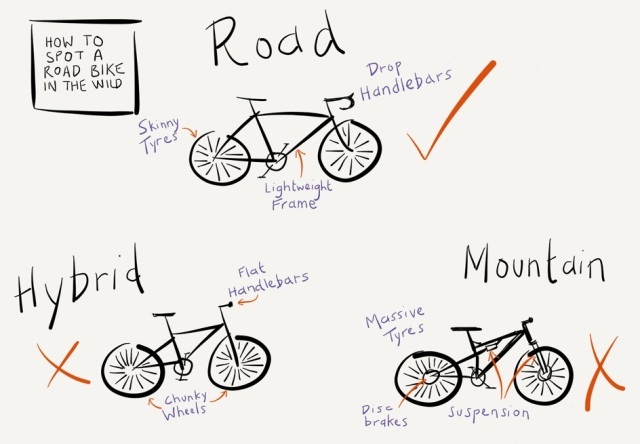 As you delve into the differences between a hybrid bike and a road bike, what you’re really exploring are the changes that have been made to a road bike to make it less suitable for out-and-out road cycling. A hybrid bike will always be a compromise between competing demands on the bike’s abilities. That all said, you should definitely feel comfortable using a hybrid if you already own one and you want to try a first sportive on for size. If you have the budget for one bike only, and you need it to perform a variety of more practical duties, as well as the odd sportive, then a hybrid is a sensible choice. 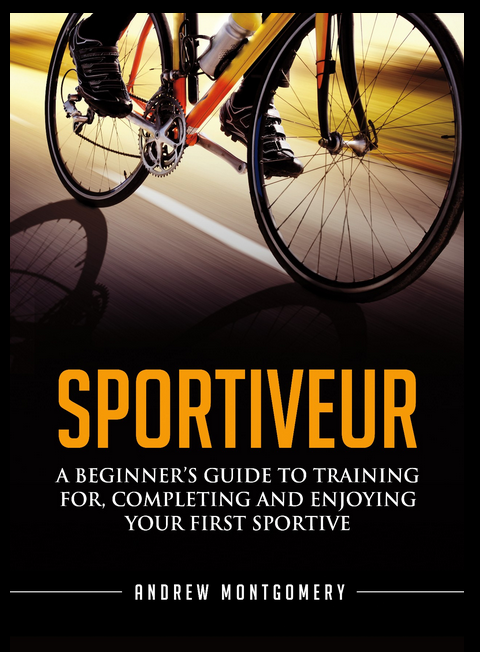 Sportive Cyclist is free to read (frankly, who’d pay for this crud?). It does cost money to run though. If you’d like to help me out, you can buy stuff through one of my links and I earn a small commission. It doesn’t cost you anything (and might even give you a warm glow inside…). If you’re in the market for a new bike: Wiggle has a fine (and well-priced) selection; Ribble Cycles are amazing value and their ‘Bikebuilder’ feature allows you to change components to see the effect on the price. If you’re looking for bike components or clothing, again Wiggle is my go-to website. Finally, if you buy anything on Amazon, I’ll get a commission if you do so after clicking through my link. All you have to do is click here and then forget about it! Many thanks – every click means a lot to me! On my first Sportive, I passed a guy riding a heavy (old and somewhat knackered – another technical biking term) mountain bike which I assume he’d either bought from Motorwold or salvaged from a skip. Apparently his road bike had broken the day before and he was doing a 100miler on his mountain bike instead.. I think he finished just after midnight the following weekend. An interesting post though, a lad at work wants to do RideLondon on a mountain bike, I’ve been pushing him down the road bike route for ease..
Don’t bother with the hybrid, they are for folk scared by the thought of drops, we went same route and now the hybrids are lounging in the garage and the roadies always used. Massive waste of money, but when you convert off an MTB the hybrid appears to be the safest route with familiar gear triggers and h-bars. Persevere with drops and you are rewarded the first headwind, other son has a weight issue and he took a few rides to get relaxed but you stick with it and discover drop-bars have been used since early last century for a reason-you can switch grip positions loads of times in a ride to ease any pressure on hands and arms. With straight bars you are stuck, and you see the riders regularly shaking their wrists to free them up on longer trips. I’m just turned 60 and won’t go back except when off roading. The first part of this post is absolutely spot on. My train of thought coming from mtb was indeed play safe with flat bars on the hybrid, but after reading kevin’s post I am really thinking of an entry level road bike. Thanks for the heads up Kev. Just bought 19year old son a Fuji 1.3C to replace a MTB and speed him up for a big ride this summer, for 2014 they’ve changed to 28c tyres, and fitted cable Promax discs, a little heavier than a typical rim-braked Road bike but the tyres and discs make it more versatile. plus he used to play rugby until injured, so not a delicate build or ideal for a delicate Cannondale…. ;-) I’m happy with the spec which is phenomenal for the money, £820 list and BB86, tapered head tube, Tiagra right through, carbon fork and very nicely finished. If too draggy may swap the 28 tyres for 25s later. So the line of choice between hybrid and roady got more blurred? Hi Kevin – is that Fuji’s cyclocross bike? You’re right I didn’t really mention cyclocross bikes as an option. I considered getting one when I was commuting in London – I think they’re a great option for that task. As you say, though, swap the tires to 25s and it’s essentially a road bike, and pro road cyclists would be using disc brakes if they weren’t banned by the UCI. It does look a bit like a cycloX bike, with a massive gear range of 11-32, whereas my Cannondale has 12-30 and his brother’s Giant Defy 12-28, although their 2014 model is 12-30 now. The tyres are slicks though, not the semi-knobblies you see on Cyclocross. Can only think it is aimed at folk coming off MTBs, although what tickled me was the top trumps spec over the £750 Cannondale equivalent, the big C wants £1100 for their sportive bike with discs. Tiagra right through front and rear, not a mix of Sora in there, hollow bottom bracket tube, carbon forks and decent seeming parts. Only moans I’ve read on forums are the brake pads on rim braked earlier models were terrible, calipers were said to be OK so advice was to swap them out for better aftermarket pads. Let’s see how good the disc pads are on the Promax units on the Fuji. It is a well finished bike though, although it was a bit of a wrench not to buy the Cannondale as they are superb, I just couldn’t resist the bargain price for all that good kit. You’ve have hit on a subject that is currently a bit of a dilema for me. Whist I got involved in many time trials and the odd road race as a teenager I gave it all up for alcohol and football. Now in my mid-fifties I have been riding around 30-40 miles at a time on a mountain bike which I got off ebay for £150 and a pair of cheap road tyres. I want to step up the miles and thought a sportive event would make a suitable target to aim for. I was thinking of buying a boardman team hybrid bike (£750 at halfords) with the idea that if all went well I would perhaps make a further investment in a sportive bike in the future. While I enjoy plodding about on my bike and even the wife and I have had a couple of cycling breaks recently, there is a limit to how serious / competitive I want to take things. I did buy a drop handlebar bike about 8 years ago but found it so uncomfortable I sold it again at a significant loss and really want to avoid making the same mistake twice. Help! Hi Steve, you can still call me Grimpeur! I think Kevin’s comment which appears above, is probably a response to your comment. And I agree with Kevin. I think you might regret spending £750 on a hybrid, rather than going straight to a road bike. The important thing is to make sure you get the right road bike – it needs to be one with sportive/endurance/’relaxed’ geometry. Sized correctly, these sorts of bikes will be comfortable for you whether you’re down in the drops or have your hands on the hoods of the brakes. I’m probably at the lazier end of the scale, but I reckon I spend 90% of my time with my hands on the hoods. This position is as comfortable as a hybrid plus, as Kevin says, I have a number of ways to shift the angle of my wrists to alleviate discomfort in that area. My sense is that ‘sportive’ road bikes have only really been around in large numbers in the past couple of years. A road bike sold to you 8 years ago could well have been a real racer. One final thing, since you mentioned Boardman. Until recently (and I think it’s still the case), the higher end Boardman road bikes (the range that isn’t sold in Halfords) all had very aggressive geometry. My bike fitter was lamenting the number of times that ‘relaxed’ riders came in insisting on buying a Boardman they’d seen being ridden by others when it was a totally inappropriate (and likely uncomfortable) fit. Reading all the comments on this blog, I think I’m convinced a hybrid would be a mistake, so I’m ready to buy my first sportive bike. Having no knowledge of what’s what with bikes nowadays what should it be? Should I be going for a proper fit measuring thing? I thought that was for people who were a bit odd size wise. I’m really average 5ft 10″ although I’m knocking on a bit now (55). I want to use the bike to work scheme to fund it so limited to £1000. Is the boardman team carbon a good place to start only mention it because our scheme is through halfords and the pictures look quite pretty. I’ve noted that on many of the blogs there is talk of painful knee’s aching backs and wrists etc. Are we being very polite and keeping a stiff upper lip and not mentioning the er well unmentionable’s. Both our FD and our Technical manager have a problem with aching nuts (there I’ve said it) when they use their bike’s and it’s put them off the whole thing really. Is this bad fitting bikes, poor posture, incorrect clothing or are they just not made of the right stuff? First time poster (thank the London Cyclist Blog) I got back in to riding about 18 months ago as a weight loss and money saving thing and went from a Mongoose hardtail mountain bike (summer 2012 until it got stolen) to a Specialized Sirrus Elite Disc (thanks to Cyclesheme) which is my daily commute. I picked up a disc Cannondale Synapse a week or so ago to prep for Ride London this year, first Sportive. Similarly my wife has gone from nothing to a Giant Boulder and picked up a Crois de Fer a month or so ago. Thoughts. I wouldn’t bother front sus on the road and would actively avoid buying it. The change from the Mongoose to the Sirrus took a few days to get used to (front sus is very forgiving handling wise) but once I’d got past that so much lighter and when I went back to borrowed bikes with front sus you just feel like all of your effort is disappearing in to compressing the forks. We asked Wiggle about using the Boulder and Sirrus in sportives and they didn’t say ‘don’t do it’ but the fact you never see a flat bar on a promotion picture kind of made us overly worried we’d turn up as know nothing noobs and be laughed off of the start line. The limited hand position is a big thing, the ergo grips on the Sirrus are OK but I still get wrist numbness, we put ergo bar ends on the Boulder which helped my wife, but I believe they aren’t allowed in the Ride London and guess other sportives might also get snippy? The rides we’ve done on the new bikes have shown the bonus of being able to go from hoods to drops to middle of the bars, although my wife is still sketchy at being so far from the brakes. Cannondale Synapse Disc version wasn’t available when I bought one, wore the original cheapo set of rim brake pads out very quickly and swapped them for Fibrax cartridges with replaceable pads. Some get creaking and ticking from the BB30 bottom bracket bearings; this surfaced on mine inside three weeks and was cured for last year by the L.B.S replacing the bearings and greasing the outside of them. Dead easy to replace though and as the noise has surfaced again a new set will go in this week. Wheels are a bit ‘cheap’ and they’ve been swapped for basic R500 Shimano hubs/rims after the bearings needed frequent greasing and adjustment; Wife’s Specialised has these wheels on and they’ve done three years regular use without being touched. Reckon the Synapse is a near-perfect lightweight endurance bike, although if buying another would probably go for the Trek or another make with Shimano bottom bracket. Hello,I’ve been enjoying your thingy (blog?) for a while and thought it might be time to add my 50 pence worth. I have returned to road cycling after going to watch Ride London last year. I was so keen to take part myself that I got a charity place on the day the ballot opened. I had a mountain bike and put slicks on it for training but soon had problems with my hands. As mentioned above you have only one position for your hands on a hybrid/mtb. I started to look at endurance/sportive type bikes and took advice at my local bike shop. The purchase of a new bike was approved by the financial director and it’s been a revelation. I recently rode 62 miles with my cycling club (hello Cranleigh) and will be riding the Isle of Wight Randonee soon. At no time (on the new bike) have I had any pain at all in my hands or anywhere else. I’m really looking forward to my 100 miles in August. Try an endurance bike and join a cycling club. I’m enjoying both. Jon – I am delighted that you hold my thingy in such high regard. I am even more delighted that you’re enjoying the life of the sportiveur. I really must grow a pair and join a club myself. Which bike did you go for? I do find your thingy entertaining. This years Ride 100 will be my first really long ride for 34 years.Boris Johnson said he wanted people to be inspired and I really was. The bike is a 4.5 Domane and is a brilliant machine. Worth mentioning perhaps that it’s easier to ride a roadie uphill than it is a hybrid or mtb. Seeing as everyone else is giving them a bit of a bashing I would like to stick up for the hybrid, well, a little bit. I certainly think they deserve more credit than they get. I was cycling to work recently thinking how glad I was that I bought a Scott hybrid as the state of the roads in this part of the country (Essex/Suffolk border), or perhaps the whole country is pretty shocking. With my errr, ahem, 18 stone on top I don’t think some road bike wheels would last very long. The wider bars give you better control and you can always pop some bar ends on for an alternate hand position. I’m not saying that road bikes aren’t better for going faster on, they obviously are, but it all rather depends on what you want out of your bike and how much you can spend. If your bike needs to do a bit of weekend riding, a bit of commuting, a bit of this and a bit of that then a hybrid would be fine. If you can afford it then all three would be ideal for me, a road bike, a hybrid (hardtail) and full susser MTB. But, if I had to have just one, it would be the hybrid. I can’t help but think some people, by that I mean ‘roadies’, get a little bit carried away spending £1000s on a carbon this and that without spending much time looking at riding position/technique. Buying a Ferrari does not make you a good driver. Good point, the bars are the thing though, stick drops on a Hybrid and you’ve got a better bike; I was same view as you thinking slicks on an MTB or hybrid until ploughing into a headwind behind the Wife, who was on her old faithful Specialised Dolce. Every single one of our group of six has eventually moved across to drops, although when tootling around the bridle paths & tracks near our village only straight bars and a MTB will do the business. Not knocking the hybrid, but we’ve bought them being unsure of drops and wasted our ruddy money. Reckon Cyclocross bikes are going to be the next big thing as they do it all. Interesting that no-one has raised the spectre of mudguard clearance…i.e room to fit mudguards. Hybrids tend to have mudguard clearance, and unless you are prepared to get very wet..at some time either training or at the event.. then you really need clearance for (mud)guards. Incedently my wife has gone for a traditional steel frame, for comfort..but as a cyclocrosser (Genesis Croix de Fer) her new purchase is comfortable, keeps her fairly dry..and has Eyes (Threaded attachments) which allow both mudguards and a pannier rack.. It really is a do (most of) it all bike…. Thanks ‘Sadold’ – good point re: mudguards, although some road bikes (such as mine) have fixings for mudguards (haven’t fitted them yet though, so may have to report back on the clearance, or lack of it). On my trusty Dawes (no eyelets) I used a clip on mudguard – after some (a lot) initial issues of it rubbing, when I finally got it to fit, I was happy with it. 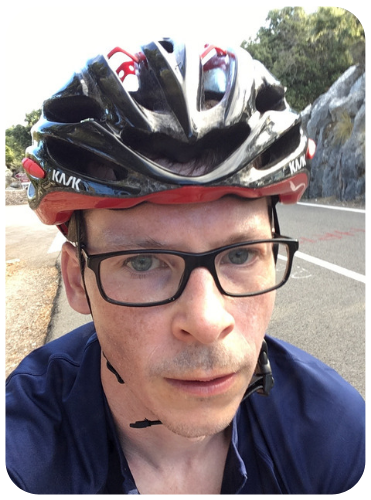 I did the London Ride 100 last year on a Hybrid, and have since bought a Road Bike. The difference in massive. I finished last year in about 7 hours, and am hoping to knock at least an hour off that this year. I know this sounds silly but you feel like your efforts are all going into the bike. Unless you’re Chris Froome’esc in build, don’t get caught in the trap of trying to get as light as possible. A lot of people spend a few thousand more to reduce the weight by the same amount as a bit of sensible eating would result in! That being said, I won’t get rid of my Hybrid. The way I see it, there will be times in the future when I don’t want to be clipped in etc. I know the rule of thumb for how many bikes is the right number to own is always n+1, but within that I’ll have room for my trusty Hybrid. Just for doing the R100 on it last year, it will always hold sentimental value. The reason your saddle seemed to be more uncomfortable on the hybrid is because of the more upright riding position. On a road bike, a rider’s weight is more distributed between hands and feet and not all of the rider’s weight is on the saddle. This dissipates shocks from the road between your hands and feet. When riding upright, a rider’s weight is predominately on the saddle, so any shocks from the road are not dampened as much by your arms and legs. It will only feel like a worse saddle, but it is just riding position. Besides that the biggest difference is going to be the engine, yourself, not the bike. A person who rides his heavy commuter everyday will beat a person who rides a road bike on the weekends anytime. Not all Hybrids are created equally. My Boardman Hybrid Pro is so much more comfortable than a “road” bike and that enables me to ride for 6 hours without experiencing the back pain that I would have got on a conventional road bike. Thanks Steve. Agreed. It all comes down to fit. There are well-fitting, comfortable road bikes and well-fitting, comfortable hybrids, as well as uncomfortable ill-fitting versions of both. Never underestimate the value of good unbiased advice from a ‘proper bike shop’ followed by a proper bike fitting. I am in the same dilemma. I am tossing up between both but leaning slightly more to the road bike. I will be using it for commuting to places within 5-10km and generally on bike paths and the odd road when it permits as i am new to road riding. Is a road bikd with the slimmer tires still alright to ride on bike paths? Im worried about hitting a raised tile or section of cement and ruining the tire. Are they more prone to punctures? Also not sure if weight will be an issue but i am 6’4″ and 90kg~ so i guess the frame might be an issue to? Am sold on the road bike idea, and getting it fitted etc. (just did Ride London on a hybrid)… However am about to get a child carrier for my 18month old. Only really have room for one bike – can I put a rear carrier on a racer? If I went carbon are the frames strong enough? Any thoughts very much appreciated. Hi Jon – it depends…. Child seats fit in one of two ways: either by sliding onto a rear rack or by cantilevering off the seat post. In both cases I’d probably feel happier with a steel or alloy bike, rather than carbon. Certainly for the one that cantilevers off the seat post I’d be concerned about crushing the carbon, plus the material itself might be too bendy, even if it doesn’t break. If you were to go down this route, I’d be tempted by bikes that are designed for the long-distance touring/audax market. Ones which are designed to take a rear rack and a bit more weight. I ride hybrid that started off as a front suspension MTB. A thief stole my suspension forks and I never rode off-road so I replaced it with rigid forks and put slicks on it. Anyhow, I commute & ride for fitness. A road bike might get me there faster but that’s not making me work harder. This obsession people have with weight and technology seems a poor, expensive excuse for riding harder. If you’re actually racing and take your racing seriously, then obviously you’re prepared to invest in your bike but I don’t think that’s what this article is about. My bike’s tyres are 50mm wide but at 80PSI, I have oodles of grip and I don’t care about grates, potholes etc. The default gearing is lower, but highest gear 44×12 has me spinning comfortably at 50km/h. I can spin faster if needed, but how often are you consistently going over 50km/h? Oh and spinning comfortably up a big hill while watching roadies grinding away has me thinking my knees will thank me later on. The alloy frame is strong. At 6’4″ and 90kg I carry much more weight I could lose than buying a carbon frame. I happily bunny hop median strips, jump off gutters etc… actually most of that is probably due to Shimano XT wheelset – 4+ years and never had to get them trued. Anyhow, I’ve broken road frames before but this bike is solid (2009 Trek 8500). Hydraulic disc brakes are simply amazing. People might be thinking there is high maintenance or issues with them but watch a YouTube video of how to maintain them, do it, it’s easy and the feel and power is fantastic. Maintaining them is easy. I see road bikes are starting to come out with them, so that’s good for everyone. Do I have any complaints about my hybrid? Not really… it has 26″ wheels so I could roll faster on 29″ or 27.5″ but what’s the point of that unless you’re seriously racing? I’m surprised I can post anonymously – anyhow I’ll reply to add I’ve done a couple of 200km+ rides on this bike. One flat (Melbourne ‘around the bay’) and another hilly one (Audax Alpine Classic) which was a long, tough day but more a reflection on how much time I can put into my cycling than the bike. As my racing days dwindle down due to family commitments, I am leaning more to selling my road bike, and then have the Giant with two wheels sets…one for weekend long rides and the other for shorter rides on rougher terrain and slower speeds. If I had no family and free time all week, I would probably upgrade my road bike, keep my Giant, add a mountain bike, and maybe a CX…. I changed the tires on my wife’s hydrid from the ones that came with it (big enough for schraeder valves) and put on some skinnier, lightweight gator treads and it improved her average speed 3-4 mph. Now she can keep up with me!